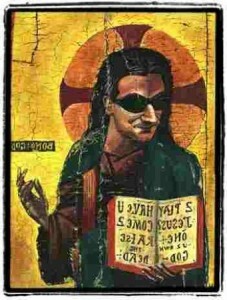 Rocker and part time saint Bono of U2 fame has had a go at internet service providers for allowing illegal music downloads. He also warned Hollywood and TV execs that pretty soon tv shows will be traded and downloaded just as easily. The aging rocker accuses wealthy web executives of getting rich off the back of the ailing music industry, which loses vast sums of revenue every time music tracks and albums are illegally downloaded and shared. Writing for a column in the New York Times, Bono said: “The immutable laws of bandwidth tell us we’re just a few years away from being able to download an entire season of (TV show) 24 in 24 seconds. “A decade’s worth of music file-sharing and swiping has made clear that the people it hurts are the creators… The people this reverse Robin Hooding benefits are rich service providers, whose swollen profits perfectly mirror the lost receipts of the music business. I think Bono and his fellow stars would get a lot more sympathy if we actually saw them suffering, and having only 3 houses instead of 5 doesnt count. Free TV and Video Websites such as Hulu, Youtube etc. are gaining popularity daily, at the expense of peer-to-peer (P2P) software who’s useage is slowing. So says a report by network-management systems vendor Sandvine. Legally Free websites account for around 27% of the webs worldwide traffic, which is up from 13% in 2008. 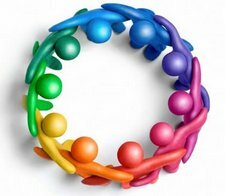 On the flip side, P2P file sharing represented 20% of all usage on the 2009 survey of 20 Internet service providers worldwide, compared with 32% in 2008. Even though the amount of traffic consumed by file sharing apps is growing on an absolute basis, tv and video on demand services are growing more quickly, Sandvine CEO Dave Caputo said. Sandvine’s 2009 Internet traffic trends report is based on data from more than 20 cable, DSL and fiber-to-the-home service provider networks representing 24 million subscribers worldwide. An Internet-usage survey Cisco Systems issued last week also found P2P traffic had declined from previous levels, although it pegged peer-to-peer at 38%. According to the Sandvine report, the mean average usage per subscriber is around 8 Gigabytes per month, while the median is about 3 Gbytes per month. The top 1% of Internet users accounts for nearly 25% of consumption, a cohort that uses 200 times the data per month as the average user. The Internet’s peak-usage window shrank by two hours, from 6-11 p.m. in 2008 to 7-10 p.m. in 2009, in Sandvine’s analysis. During that “primetime” period, the usage profile among all users was roughly equivalent, whereas the heaviest users (sometimes called “bandwidth hogs”) use their connections 24 hours per day. “From 7 to 10 p.m., we’re all consumption kings,” Caputo said. Given the 7-10 p.m. usage peak, Caputo noted, service providers have a strong incentive to try to encourage the use of non-real-time application at other times. “If you could shift some of that usage to the other 21 hours everybody would win,” he said. The data for Sandvine’s report was gathered between Sept. 1-22 and captured the bits-per-second, per protocol and the number of active hosts per protocol on the network. The data does not include any subscriber-specific information, such as IP addresses. Of course, if the currently free websites go down the pay to view route then peer-to-peer will come back with a vengeance. The networks may not like the word free, but its the only way to kill off piracy. You have heard about the great concept of watching TV shows and movies on your TV set, so you settle down in front of Hulu and start streaming the show. Then… You get the dreaded message ‘ Why? Because you are in the UK or France or Canada. The TV site is US based and noone else gets to watch it. Pretty lame huh? Geo targeting or geo gating, which the networks themselves refer to it restricts access to streaming content outside the countries to which they have the rights to broadcast. It seems a very outdated concept in these days of instant entertainment and the global community but until the networks sort out this mess we have to put up with it. Or do we? “Hulu is committed to making its content available worldwide. To do so, we must work through a number of legal and business issues, including obtaining international streaming rights. Know that we are working to make this happen and will continue to do so. Given the international background of the Hulu team, we have both a professional and personal interest in bringing Hulu to a global audience. So what do you do while the networks try to find a workaround to the problem? There is a roundabout solution if you happen to reside in another country and it is free to use. Watch Hulu Outside the USA. This information also applies to Watching the other big networks such as CBS, ABC, NBC and FOX TV episodes from other countries outside the USA. The company make revenue from an advertising banner that is displayed at the top of your screen as you watch the streams. So are these kinds of programs legal? Well, noone has been prosecuted yet and no case that i know of has been put before a court. And the liability would not be with the user anyway. If anyone where to get prosecuted it would be the program creator not the user. More likely that the networks will, when it becomes a sufficient annoyance work a way around the softwares geo cracking abilities. They may of course not bother. After all viewers have many ways of viewing and downloading illegal content if they wish. So maybe the answer is an opening of the borders , and until thats possible. A little flexibility. After all the younger generation of this world are used to the web being full of free content. Not being restricted because they live in Europe and not the US and vice versa. Secondly you can browse our catch up tv section and choose the current streams available in your country. I think everyone is pretty clued up on P2P networks and Torrent sites. They are used to download files such as movies and games etc. They do have their uses, but the main drawbacks are that your IP address is recorded which may come vback to haunt you. Plus the fact that the download speeds sometimes crawl along or stop entirely. UseNeXT have software that makes it easy for anyone to browse the millions of topics/discussions happening in the Usenet and find what you require. UseNeXTâ€™s software automatically uses a fast delivery server, allowing you to download anything from Usenet at your Internet connectionâ€™s maximum speed. Plus, you are also guaranteed that there will be no limitations when it comes to your download rate. The great thing about Usenet is that there are no restrictions on space, so users can post massive files to share. ‘Establishing the identity of the person posting illegal content is equally difficult due to the trust-based design of the network. ..most P2P users distributing content are typically immediately identifiable to all other users by their network address, but the origin information for a usenet posting can be completely obscured and unobtainable. So basically you get an unlimited choice at the fastest speed with no tracking of your IP. It is much better and consistent at downloading than peer-2-peer or torrent sites. And an extra bonus is that you don’t have to share. So at last your able to make the full use out of your high speed internet connection. You can actually download at maximum speed with no restrictions on download speeds. Well unfortunately you would be 100% right on that, we have already taken a look and reviewed the free satellite TV packages, and come to the painful conclusion that the sales pages are far from truthful. In fact it is more than an untruth, it’s a damn right scam! So what exactly is the Satellite TV PC scam? Well after payment you will be sent to a download link for a software program, or evenworse you may just be sent to a webpage consisting of a list of free to view tv channels, which are all available for free on various websites just like this one. Although i am sure you will agree that the TV streams are great, making you pay for something that is free is pretty bad right? Well the other product you may get in this kind of deal, either on its own or bundled with the satellite tv product is a P2P program that is also freely available on the web. Most of these satellite tv software products consist of a list of free to view internet tv channels – so there are your thousands of channels. Also free sports, latest movies and TV shows and full episodes are offered, where do they come from? Well again it aint rocket science these guys use. They simply give you a freely available P2P software application to install and search for your show/movie/sports event. So my advice is do not buy this junk, just search Google for the same stuff for free. Once you have done that, congratulations are in order. You can now pat yourself on the back as you have just saved yourself from paying $30-129 for one of these products. Even if you think it’s junk, it has taught you a very valuable lesson. Legitimate Satellite TV costs a monthly subscription from companies such as HBO and Sky, and there are (unfortunately) no shortcuts. 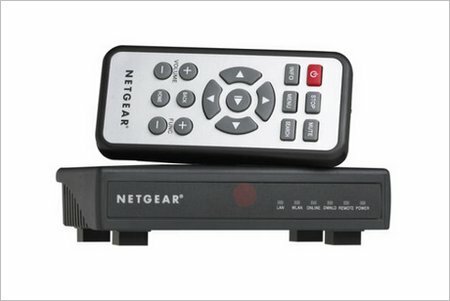 Netgear have announced a new Internet TV settop box that will play video streams from Youtube etc. But also has an inbuilt torrent app allowing users across the world to download any TV show or movie they want. The new hardware lets owners view internet streaming from video sites such as YouTube straight onto their Television screen. Much more exciting though is the deviceâ€™s built-in BitTorrent client. Watching movies and TV episodes on BitTorrent is popular because you can view from anywhere in the world. The new device can play videos from several large streaming sites, including YouTube, Google Video and Metacafe. However, its true power comes from the built-in BitTorrent client. Millions of people use BitTorrent to download TV-shows every week, so there are a lot of potential customers out there. In effect, using a torrent for a popular movie or show makes downloading faster because the more people that want to download it results in a higher download speed for all users. 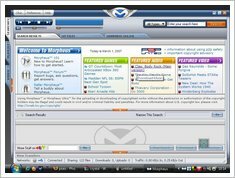 A torrent is a slightly different method of p2p sharing and there are many torrent clients available. The new Netgear device will be popular outside the US, as that is where most of the TV torrent downloads occur. The main reason being that fans have to wait for weeks or months before hit TV shows air in their own countries. The device also has a USB socket to allow connection of external USB drives. Plug in, and watch all your videos on your big screen TV instantly. Netgear’s Internet TV Player will cost $200, and be available in early Summer 2009. Of course many people can already watch downloaded movies and tv shows just by buying a lead and connecting a notebook straight to your TV. So this device will be for the uninitiated, especially at this price.